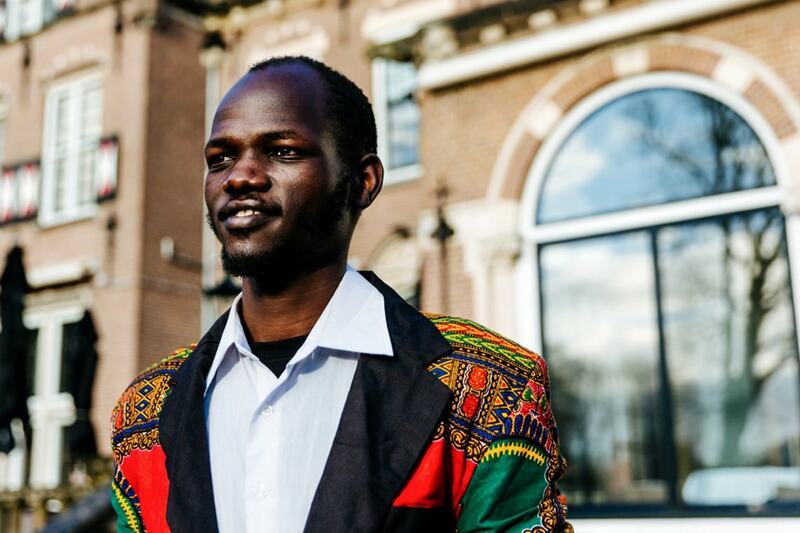 James Thuch Madhier fled South Sudan as a teenager, escaping the ravages of civil war and famine. Next fall, the U of T undergrad and his social entrepreneurship team will be testing out their solar-powered crop irrigation system on 20 acres of land they've acquired in South Sudan. Madhier came from South Sudan via Kakuma refugee camp in Kenya through U of T's Student Refugee Program (SRP), which sponsors refugees in collaboration with the World University Service of Canada. Now a third-year peace, conflict and justice student at U of T's Munk School of Global Affairs, Madhier has worked with his classmates, Mike Hongryul Park, a math and physics student with a passion for sustainable development, and Katie Fettes, a fellow peace, conflict and justice student at Munk, to create a basic, solar-powered crop irrigation system that provides clean drinking water to countries in the developing world. The team's system, which includes a pump, a holding tank for the seasonal flood waters, solar panels to generate power and drip irrigation, is easy to install and use in South Sudan, where 80 per cent of residents are farmers or raise cattle, only 30 per cent have access to clean drinking water and 5.1 per cent of the population has electricity. “We’ve adapted the system in a way that will not only irrigate food crops and provide grazing grass for cattle, but will also offer employment to women and youth and address issues of food insecurity,” Madhier said. In 2016, Madhier, who has long been active with social development programs, was invited by the One Young World organization to attend a global summit for young social changemakers. The summit included a social venture competition, and Madhier and Park decided this was the perfect opportunity to seek assistance with the irrigation project. Madhier pitched the idea at the summit and won a fellowship award as well as some seed capital and access to professionals who can mentor him. This past March, the team formally launched Rainmaker Enterprise in partnership with Emmanuel Jal, a former child soldier-turned-musician from South Sudan, and they purchased land in South Sudan to test out the irrigation system during the November dry season. For the project, the land will be divided so that cows can graze in one area while crops can be grown in another area. It will allow for crop rotation so the land remains productive for both food and grazing. Madhier has a local field manager who will hire a local team to assist him, creating a self-sustaining enterprise. Madhier says that as a teenager he saw some horrific things during the famine. After a trip to the Ivory Coast last year to research issues surrounding cocoa farming, Madhier realized that the problems of drought and food insecurity were much more widespread in Africa than he’d realized and decided to do something about it – not a quick fix solution, but something that would effect systemic change. “Today, I know there has been technological advancement that could be used to lift people out of extreme hunger and food insecurity,” he said.